Catholic theologian and anti-Semitic author; born in 1839 at Neuenkirchen, province of Hanover, Prussia. He studied at Münster and Paris, and became professor suecessively at Münster, Milwaukee (Wis.), and Prague, retiring in 1901. He is still (1905) canon of the Cathedral of Prague. Not prominent as a scholar in his specialty, which is Hebrew archeology, he has distinguished himself in an unenviable way by his polemics against Protestantism and Judaism. Of his anti-Jewish works "Der Talmudjude" (Münster, 1871, and often reprinted) has become a standard work for anti-Semitic authors and journalists, although it is merely an abstract of the "Entdecktes Judenthum" of Eisenmenger, and even as such very faulty. The book first appeared, at the time when Bismarck inaugurated his anti-Catholic legislation, as a retort to the attacks made by the liberal journals on the dogma of infallibility and on the Jesuitic text-books of morals, it being usual for the anti-liberals to pretend that all liberal newspapers were controlled by Jews. The book was very extensively quoted by the Catholic press and created quite a literature, but it did not become a political force until the appearance of anti-Semitism, and especially until the Tisza-Eszlár trial in 1883, when Franz Delitzsch defended Judaism against the attacks of Rohling. At the same time Josef S. Bloch wrote articles in which he accused Rohling of ignorance and of forgery of the texts. Rohling sued Bloch for libel, but withdrew the suit at the last moment. Later on he greeted the appearance of Zionism as the solution of the Jewish question, and lately he has written a pamphlet against Güdemann's "Das Judenthum in Seinen Grundzügen," etc. 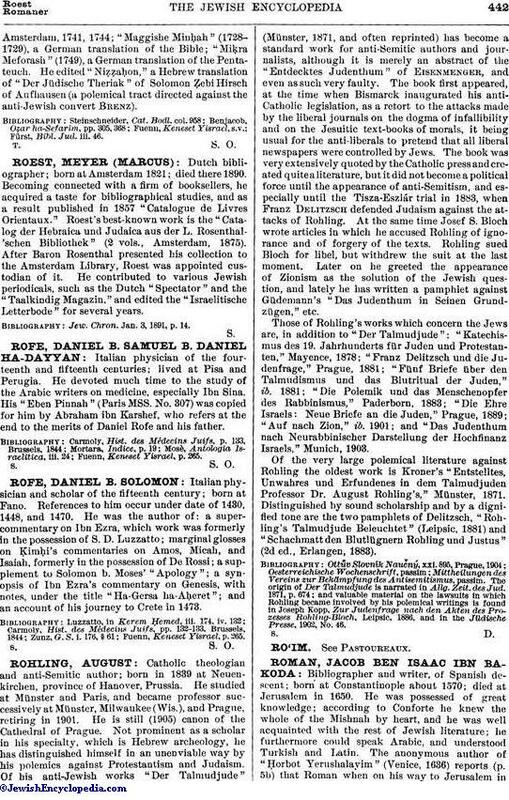 Those of Rohling's works which concern the Jews are, in addition to "Der Talmudjude": "Katechismus des 19. Jahrhunderts für Juden und Protestanten," Mayence, 1878; "Franz Delitzsch und die Judenfrage," Prague, 1881; "Fünf Briefe über den Talmudismus und das Blutritual der Juden," ib. 1881; "Die Polemik und das Menschenopfer des Rabbinismus," Paderborn, 1883; "Die Ehre Israels: Neue Briefe an die Juden," Prague, 1889; "Auf nach Zion," ib. 1901; and "Das Judenthum nach Neurabbinischer Darstellung der Hochfinanz Israels," Munich, 1903. Of the very large polemical literature against Rohling the oldest work is Kroner's "Entstelltes, Unwahres und Erfundenes in dem Talmudjuden Professor Dr. August Rohling's," Münster, 1871. Distinguished by sound scholarship and by a dignified tone are the two pamphlets of Delitzsch, "Rohling's Talmudjude Beleuchtet" (Leipsic, 1881) and "Schachmatt den Blutlügnern Rohling und Justus" (2d ed., Erlangen, 1883). Mittheilungen des Vereins zur Bekämpfung des Antisemitismus, passim. and valuable material on the lawsuits in which Rohling became involved by his polemical writings is found in Joseph Kopp, Zur Judenfrage nach den Akten des Prozesses Rohling-Bloch, Leipsic, 1886, and in the Jüdische Presse, 1902, No. 46.